Be the first to share your favorite memory, photo or story of Ruth Ann. This memorial page is dedicated for family, friends and future generations to celebrate the life of their loved one. 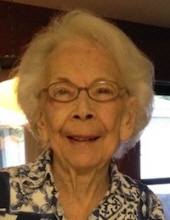 Ruth Ann Wissel of Houston, passed away on January 19, 2019. She was born to the late Harry and Marie LaOrange in Logansport, Indiana on July 26, 1922. Ruth Ann was predeceased by her loving husband of 61 years, Walter J. Wissel. They met after his WWII service, married, and began their life together at Notre Dame’s Vetville, the married housing for veterans. Ruth Ann was a stay at home mom who enjoyed daily mass at St. Vincent de Paul Church, feeding the birds, watching Jeopardy, doing crosswords and socializing with friends at West University Senior Center. Happiest when surrounded by family, she was a devoted mom to her four children; Joe, Nancy, Mary Ann, and Anne. She leaves behind 7 grandchildren, 2 great grandchildren and several loving nieces and nephews. Ruth Ann was a model of patience and full of unconditional love. She will be remembered for her wit and impish grin. A visitation will be held on at St. Vincent de Paul Catholic Church in Houston on Saturday, January 26, 2019 at 9 a.m., followed by a rosary at 9:45 a.m. and a funeral mass at 10:30 a.m. Interment will follow at Forest Park Westheimer Cemetery in Houston. The family wishes to thank all those who cared for her during her last years, especially Ross Mary, Sodalis Memory Care and Hope Hospice. Memorial donations may be made to St. Vincent de Paul Catholic Church, 6800 Buffalo Speedway, Houston, TX 77025 or Hope Hospice, 611 N. Walnut Ave., New Braunfels, TX 78130. To send flowers or a remembrance gift to the family of Ruth Ann R. Wissel, please visit our Tribute Store. "Email Address" would like to share the life celebration of Ruth Ann R. Wissel. Click on the "link" to go to share a favorite memory or leave a condolence message for the family.